You may have heard that a large number of the world’s languages are dying. That may have caused you to wonder if it might be a waste to translate the Bible into those languages. That is a very good thing to wonder about! As you might expect, the answer is not a simple “yes” or “no”. First, how many languages are dying out? Well, UNESCO has an Atlas of Endangered Languages (Moseley, Christopher (ed.). 2010. Atlas of the World’s Languages in Danger, 3rd edn. Paris, UNESCO Publishing) which you can find on line at http://www.unesco.org/culture/languages-atlas/en/atlasmap.html. For Ghana, it lists five languages as endangered. There are five degrees of endangerment ranging from vulnerable to extinct. Languages not endangered are listed as “safe”. 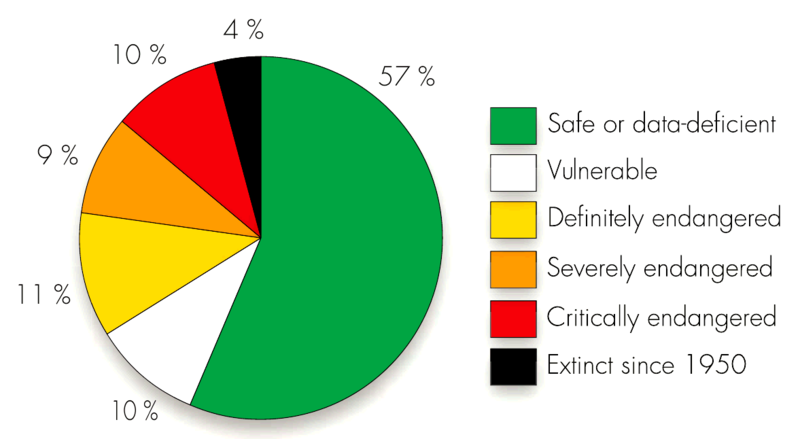 Here is the UNESCO language vulnerability scale definitions for each degree of endangerment. None of the Ghana languages are extinct. Only one gets the next-worst ranking – “critically endangered”, and three get ranked as having the least severe degree of endangerment – “vulnerable” – where most people still speak the language. So it is far from certain that all of the five languages listed as endangered will die out. Even if they did, because there are more than 60 languages spoken in Ghana, at least 55 languages will continue. They are in no danger of dying out in the foreseeable future. In fact, almost all of them will probably even continue to grow. The situation is similar to this is much of Africa. On the other hand, many languages in other parts of the world seem to be headed toward almost certain extinction, as the following chart shows. Before we translate the Bible into a language, we do some research to find out if the language is dying, and other facts about it. This assures that we make a good investment of God’s resources. We also make the decisions by taking into account the situation for each language, not on the basis of global trends. So it might be that the Internet is actually making a way for smaller languages to survive, perhaps even extend themselves. Trends in human society are rarely linear or easy to predict. What seems obvious, sometimes turns out to be false. Rest assured that we pay special attention to the question of language death in our planning and decision-making. Our agenda is to serve people who speak languages that are very much alive. If you liked this, you might also like Teach Them English.